We are so conditioned to thinking of the years after the Second World War as some kind of golden age that it is refreshing to see how American films dealt with the era. Some prominent examples include William Wyler’s The Best Years of Our Lives (1946) and Vincente Minnelli’s film adaptation of James Jones’s Some Came Running (1958). In both pictures, the GIs come home to find that the guys with flat feet who stayed behind had all the jobs, money, and women. From the opening credit sequence with its urban jazz music track as we see Frank Sinatra asleep on a Greyhound bus as the Indiana landscape rolls past, we feel we are in for something different. 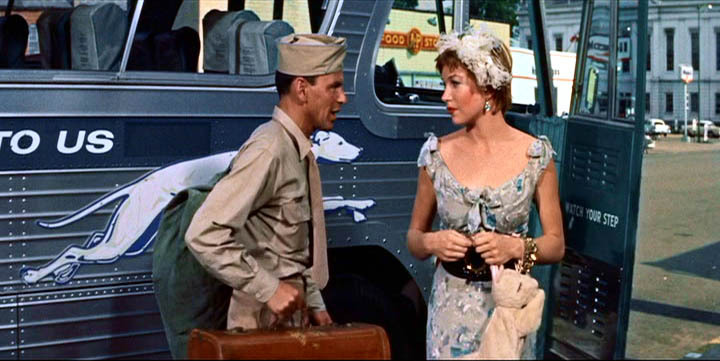 On the same bus is Shirley MacLaine as a good-time girl Frank had met in Chicago. Both had been drunk and were put on the bus by friends who specified Parkman, Indiana as the destination. We see Frank at the beginning in his army uniform, though he has also written two books and spent time on a tramp steamer and as an oil rig worker. In Parkman, he is pursued by Shirley while he falls in love with Martha Hyer, a college writing instructor who is impressed with his writing ability but appalled by his lifestyle. Every time he is repulsed by Martha, Frank draws closer to Shirley MacLaine with her ridiculous doggie purse and showy bad-taste clothing, with an intellect to match. There are a number of significant divergences between the James Jones novel and the Minnelli film. As I have not yet read James Jones, I cannot say which I prefer. 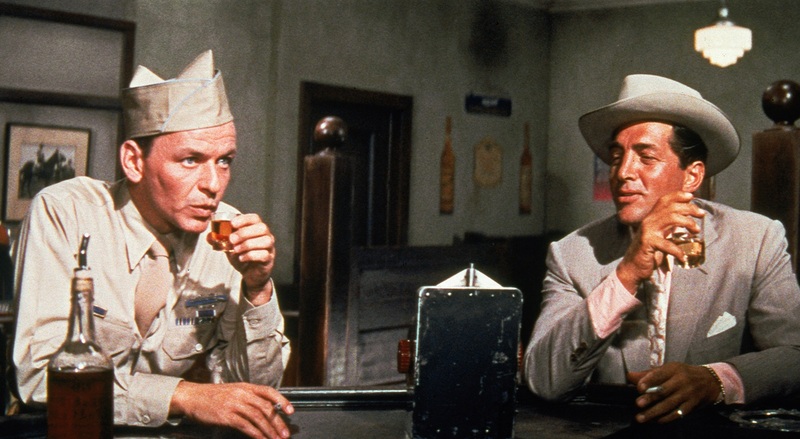 But one thing I can say is that Minnelli’s film is even better than The Best Years of Our Lives at portraying the sick soul of America coterminous with its postwar glory, even though the two films are more than ten years apart. This entry was posted in film and tagged dean-martin, frank-sinatra, postwar-films, some-came-running, vincente-minnelli. Bookmark the permalink. Super movie w/great cast. Loved it.